Surface staining of RAJI human Burkitt lymphoma cell line with anti-human CD80 (MEM-233) APC. Total viable cells were used for analysis. 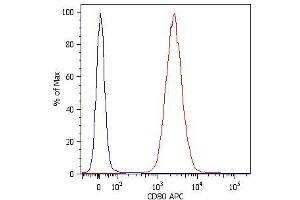 Specificity The antibody MEM-233 reacts with CD80 (B7-1), a 60 kDa single chain type I glycoprotein of immunoglobulin supergene family, expressed on professional antigen-presenting cells, such as dendritic cells, macrophages or activated B lymphocytes.